Studying….hmmmm….yeahhh. Oooh! Did you see that cute bunny outside the window? Mad Men is on again? Let’s watch an episode. Or two. Or eight. Grrrrr. Was that my stomach? Maybe I should put aside my Latin declensions for a few minutes and make a snack. Yes, that sounds perfectly reasonable. For me, studying is accompanied (or perhaps more correctly, interrupted) by many things. I like to have a good playlist running, Stumbleupon opened up in a window on my computer, and some tasty nibbles at hand to make the tedium a little more bearable. Obviously, the snacks must be thoroughly thought through and laid out ahead of time. Because if they aren’t. Well? You don’t want to know how that would end. I like my snacks sort of extreme. Either super salty or very, very sweet. But I also like them to have the pretense of health about them. Sort of a tall order, I know, but hey, a girl can dream, right? They usually venture into the territory of air-popped popcorn topped with a glug of olive oil, a few shavings of parmesan, and a hearty sprinkling of sea salt, a granola bar slathered with Justin’s maple almond butter, or carrots and lots and lots of hummus. With fall on its way, however, and my desire for warm apple cider and cashmere sweaters mounting, I’m craving something a little more special, a little more seasonal. And nothing says autumn like apples. Especially coated in a thick, sticky layer of caramel. Line a baking sheet with parchment paper. Unwrap caramels and put in a clean, microwave-safe glass bowl. Add half-and-half. Microwave for 45 seconds. The caramel may bubble up. Stir gently with a spoon or rubber spatula. Stick chopstick or popsicle stick into the center of each apple. 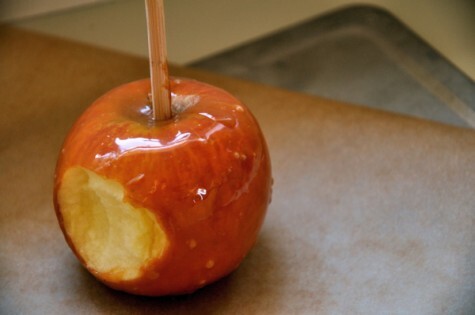 Roll each apple in the caramel, spooning over the top to cover completely. Roll in toppings, if desired. Place on parchment-lined baking sheet and let rest until caramel has set. 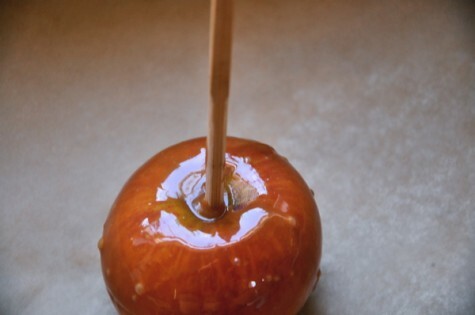 Mmm caramel apples are the best and they exude seasonal flavor. I like how you felt you had to specify “clean” bowl. Ha! I must be a little far removed from my college days (4 years to be exact). I forgot how hard a clean bowl was to come by. Nice recipe btw, super easy and looks delish! Half and half is literally half cream and half milk. Lots of people put it in their coffee for a nice compromise between fattening heavy cream and less good tasting milk haha. I’m 99% sure they’d have it at your campus coffee shop type thing like out near the sugar and stuff, so since you only need two teaspoons for this recipe, just pour a tiny bit in the little plastic containers used for condiments and take it home to make your caramel creamy and delicious! For free!